By the title, the assumption might be made that this post is about brewing coffee at home and avoiding the daily lines at the local cafe, but for this non-coffee drinker it is all about the Bistro Boxes they offer for a quick snack! I have a bad habit of not eating much of anything in the morning - I never have much of an appetite getting ready at home before work, and when I do get to work I usually dive right in to emails and meetings and don't think about taking a few minutes to grab something for the stomach. At the grocery store the other day (where we stocked up on ingredients to make risotto, gnocchi and lasagna over this next week, yum! ), I picked out a few items to try my hand at making DIY snack boxes, inspired by the Starbucks packs I like to grab every once in awhile - usually when gift cards for the coffee giant find their way to me. 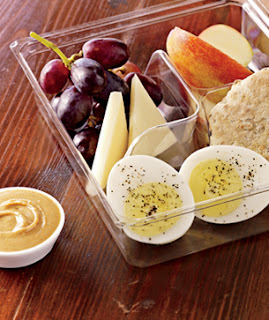 Here's a shot of Starbucks' Protein Bistro Box: hard boiled egg, peanut butter and honey spread and multi-grain bread, cheese, apples and grapes. And here's what I built: hard boiled egg, grapes, swiss cheese cubes, wheat thins, a few pretzel sticks and a Babybel semi-soft cheese. I would have liked to add a few apple slices, but need to think about the best way not to let them brown. 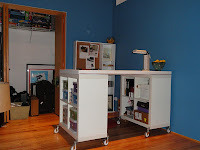 Something tells me a Pinterest search will be solving that conundrum! I multiplied this snack box by 4 to stock the fridge for the week. I later realized I should wait until the morning to add the pretzels and wheat thins to the boxes as their taste was a bit affected by the cold refrigerator and mix of food in the tupperware with it, but that was a simple lesson learned. Buying a six pack of Apple Juice also ensured I was drinking something in the morning before my noon hour Pepsi habit kicked in. A great idea! I have lots of pins from pinterest about different snack ideas with these containers! Also, if you put apples in pineapple juice they will not brown, water will kind of do the same thing! So smart! I use lemon juice to keep apples from browning when I pack Nels's lunch the night before. Pineapple juice sounds even better. :) I really like that divided tupperware you have there. thanks for the ideas! I also like the idea of adding dried fruit - just went a bit crazy at Produce World on dried apples, pineapple and kiwi!